Our Email report measures efficiency working with email conversations. You'll be able to keep track of how your team is performing in terms of time spent addressing and responding to conversations. Note: Looking for the Productivity report? The Email report is taking its place! If you still have the Productivity report in your account, hang in there and you'll see the new report soon. Take a peek at What’s New with Channel-based Reports for more info on the changes you'll be seeing. If you have any questions, just let us know! How long are customers waiting for a reply? This is where the Response Time metric comes in. It is an average, based on your filters, and is a good indicator of how active your team has been in the queue. If you take a gander at the response time graph, you might find this comparison useful to get a quick overview of different time periods. 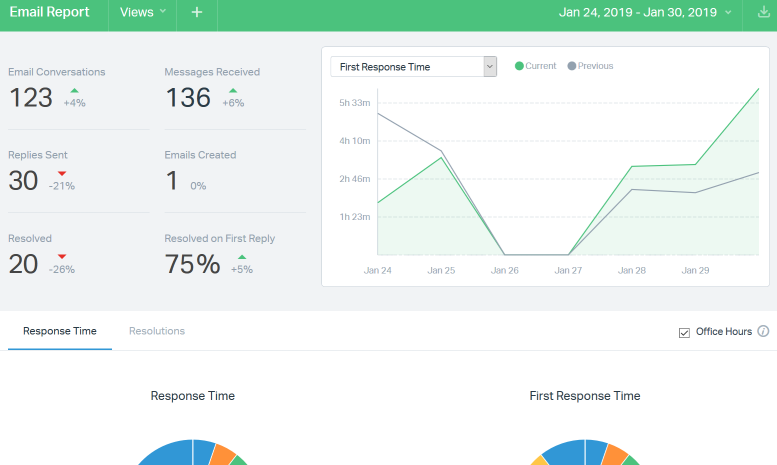 How long are customers waiting for our very first reply? Nobody likes to be kept waiting, and a simple first reply goes a long way. Month over month, you might use this metric to quantify higher or lower first reply times. Were you short-staffed, or did a huge issue pop up that took more time to address? For example, you might find that 77% of your conversations received a first response in under 15 minutes or less (which is an incredible feat, mind you!). But what about those straggling conversations that took forever to address? You can drill down to quickly see which conversations got left behind. How many times are we going back and forth with customers? Lengthy exchanges could mean that not enough information is being given with each reply, or perhaps you're receiving a handful of complex questions which require multiple messages. 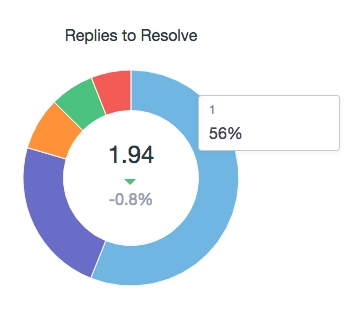 On the flip side, a low number of replies could be a sign that your team is providing really thorough answers right off the bat (high five!). In our example below, 56% of our conversations needed only 1 reply to resolve. How long is it taking to address conversations? Handle time measures the time from when the conversation is opened, to when a reply is sent to the customer. You'll find that higher handle times correspond to really long replies, or a lack of resources or knowledge on the User side. What does that really mean? For one, you could drive handle time down with more saved replies, or even an internal knowledge base. Both of these little tools keep the User on the same page, focused on the reply, and not bouncing between tabs to find additional information. 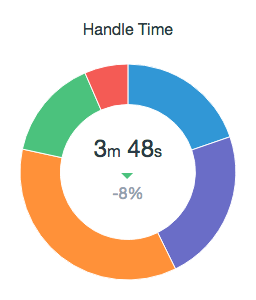 Based on our example below, our average handle time for the filtered period was 3 minutes and 48 seconds. In other words, it took us close to 4 minutes to open the editor, whip up a reply, and send it off.